This deep purple vegetables has been described to have a pleasant bitter taste with a spongy texture. The eggplant is also available in many other colors like lavender, jade green, orange, and yellow-white. Eggplants are great sources of vitamins, minerals, and important phytonutrients. The phytonutrient, nasunin, found in the eggplant skin, has been shown to be a potent antioxidant. It gets rid of free radicals in the body and protects the cell membranes from damage. It has been shown in animal studies that nasunin protect the lipids in brain cell membranes which protect the cell from free radicals and allow nutrients in and waste out. Nasunin is more than just a potent free-radical scavenger, but also helps to get rid of excess iron. Although iron is necessary for the body, too much can increase free radical production and will increase the risk of heart disease and cancer. Nasunin lessens free radical formation with numerous beneficial results which include: protecting blood cholesterol from peroxidation; preventing cellular damage that promotes cancer; and lessening free radical damage in the joints. Eggplants are a good source of phenolic compounds. These compounds act as antioxidants. The predominant phenolic compound found in eggplants is chlorogenic acid. This is one of the most potent free radical scavengers found in plant tissues. The benefits this phenolic compound is associated with are antimutagenic (anti-cancer), antimicrobial, anti-LDL (bad cholesterol) and antiviral activities. Eggplants are also high in fiber, which helps in digestive processes and acts against coronary heart disease. They also contain potassium which balances salt intake, maintains hydration, and regulates blood pressure. The eggplant also contains folate, magnesium, niacin, copper, manganese and Vitamin B1. People with existing and untreated kidney or gallbladder problems should avoid eating eggplant. This is because eggpalnts have measurable amounts of oxalates, and when they become too concentrated in body fluids, they can crystallize and cause health problems. Oxalates have also been shown to interfere with absorption of calcium from the body. “Health Benefits of Eggplants” Cespedes, Andrea.Livestrong, 11/30/2010. Web. 2 July 2013. “Glorious Health Benefits of Eggplants”DiPirro Carol.MyYOGA, 10/21/2010. Web. 2 July 2013. “Eggplant”. World’s Healthiest Foods, n.d. Web. 2 July 2013. 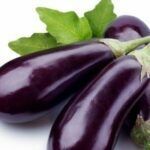 “Health Benefits of Eggplants”. The Healthy Archive, 3/27/2013. Web. 2 July 2013.